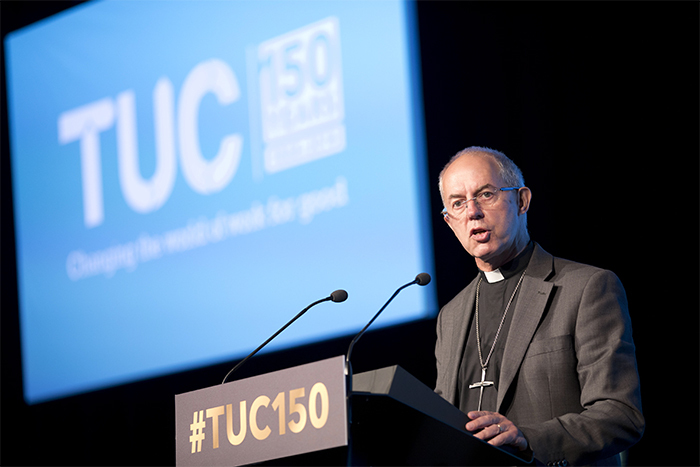 Archbishop Justin Welby delivered a speech at the annual conference of the British Trades Union Congress (TUC). Here is an analysis of the address for those of us who support our leaders making political interventions for peace with justice, especially those who may not be familiar with the UK context. The first audience were the gathered Trades Union activists listening to him in the auditorium. The speech focused throughout on issues of work and workers, picking up on key themes for the TUC such as low pay, insecure employment. The Archbishop had some key messages that were designed to raise applause from the floor. Those key messages were designed to be picked up by national media outlets and so the Archbishop was able to address the UK public. His key messages were also aimed at those in power – both politicians and those with economic power. The former were not directly named, but corporations such as Wonga and Amazon were. The Church was also addressed – our failures were highlighted as well as the part we should play in the transformation of society. Archbishop Justin repeatedly used as a rhetorical device a quotation from the prophet Amos – “Let justice flow down like waters, and righteousness like an ever-flowing stream” to hold the audience and to build a vision. Some commentators made the connection to Martin Luther King, who used phrases such as “I have a dream” at the March on Washington for Jobs and Freedom, or “was Jesus and extremist” in his Letter from a Birmingham Jail.” In reality the device is far older. Shakespeare used it when he put the words “Brutus is an honourable man” in the mouth of Mark Anthony for his great political speech in his play Julius Caesar. Justin is not a dramatic orator in the line of MLK and is not a Shakespearean actor – but the use of the device indicates the care taken to craft a speech and was effective, giving rhythm and power to the key points. These were marked by applause and pointed to the sound bites that would be on the TV news. It was a very successful format. His key message was: Christian leaders must be political – but not party political – and specifically this means over whelming support for the oppressed over the powerful. He went on to admit the historic failure of the Church of England to live up to this ideal, especially the leaderships failure embrace the emerging TUC 150 years ago. He contrasted this with his own history of welcome as Dean of Liverpool Cathedral. His first applause line was his condemnation of insecure working practices as “the reincarnation of an ancient evil” and he followed that with the first repetition of the Amos quote. The Archbishop then spoke out against Anti-Semitism; an issue that had dominated UK headlines fro a number of weeks. This indirect rebuke to the leadership of the British opposition party – Labour, a close ally of the TUC – was an issue that needed addressing and the Archbishop was entirely sincere. A week earlier he had met the Chief Rabbi to talk about the issue and express his support. It also enabled him demonstrate that his was a non-partisan political intervention, levelling out his indirect (but clear) critique of the ruling Conservative Party with indirect (but clear) criticism of the Labour leadership. His next target was specific: corporations who avoid paying taxes – and significantly Amazon was named and shamed. The condemnation was severe of companies leeching on community – for example, expecting high levels of education and yet not willing to pay for it. The Archbishop then offered hope. He challenged a thinker who argued that change only comes following war, famine, disease, revolution and natural disaster and pointed out that he had predicted the fall of a once seemingly mighty company of questionable morality – Wonga. He challenged governments to end the need for food banks – an increasingly significant part of Church mission among the poor – and set out a vision for a better future. This future includes the rich paying taxes. He also highlighted the need for organised labour and the TUC in offering hope of a better future. The final section of the Archbishop’s speech focused directly on the TUC and the need for them as an institution to avoid seeking power for its own sake and to be open to change. Failure to adapt would be a failure to address the needs of an ever changing world. This, he argued, was a problem faced by the church: it had sought power for power alone and not been open to change. In contrast Jesus served as a witness to this hope – a serving figure in touch with human reality and challenging power. If we adapt – if we all adapt – if you adapt, the Church also, serving the common good, helping to establish justice, acting in righteousness, not frightened and self-protective and power-seeking, but courageous and self-giving, then we may expect with joy that in this land justice will flow down like waters, and righteousness like an ever-flowing stream. The speech was skilfully crafted; drawing attention to the key messages the Archbishop wanted in the public domain. The media response picked up on the desire for an end to extreme poverty, the criticisms of corporate giants such as Amazon and established the Archbishop and the Church as a voice for the poor and oppressed. By what authority did the Archbishop speak? The first was raised in an opinion piece in the left leaning and largely favourable Guardian and the second by those who did a bit of research and found that the Church commissioners invested in Amazon – the very company the Archbishop highlighted for criticism. Both of those are significant questions for all of us who seek to stand for Peace with Justice and so there will be two further posts exploring the wider issues. Next → Next post: By What Authority?